If you thought you had to travel to exotic locales to photograph captivating subjects, think again. 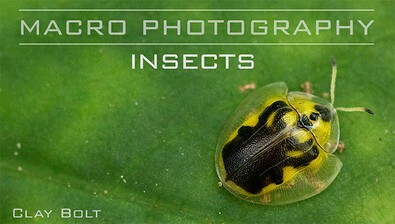 Award-winning conservation photographer Clay Bolt shows you how to find, approach and photograph fascinating insects in your own backyard with spectacular results. Learn to work with available light and shallow depth of field to create crystal-clear images. Explore a variety of off-camera flash setups to enhance color and texture, increase sharpness and freeze motion. Use wide-angle macro lenses to create surreal images that showcase your subject and its habitat, and get Clay's expert tips for successfully photographing insects in flight. Finally, learn to adjust images in the digital darkroom to illuminate the beauty of translucent wings and emphasize eye-catching textures.